The Sewer Den is swimming in TMNT merchandise. I usually weave a common thread when writing about them - a theme to connect the mutated pieces. But occasionally, a few treasures claim themselves as outsiders. I have 3 random items here from the 2K3 cartoon series. They have nothing in common, except for the same TMNT era. Come one, come all to an early 2000s celebration. These party invitations are a flea market find I nabbed for only a couple of coins. I often dream of hosting a TMNT-themed party, so these were hard to refuse. Unfortunately, my solo party planning committee hasn't masterminded a celebration just yet - keeping the invitations in their packaging. The design is simple, and honestly, only remotely fun. The Turtles are too serious to party. This looks like a hostile celebration. Where are the amusing hijinks we have come to expect? The back of the packaging doesn't light any fires either. There's just a bunch of boring stuff that you only read if you're an adult writing a TMNT blog (hey, that's me!). If you were in the market for menacing party cakes, there's a phone number. Out of curiosity (boredom), I punched in the digits & called. The number is still active and still selling merchandise! Unfortunately, their supply of decade-old TMNT inventory is all tapped out. Mutate into an interior designer with the TMNT switchplate. With this wild piece of merch, fans can transform their rooms into a sewer lairs. Not sure if kids scream "Turtle Power" about covering their light switches, but hey, here it is. The 2K3 seriousness strikes again. Except for Michelangelo, the Turtles have gone grumpy. Was the cartoon from 2003 really this serious? I know it was no 80s farce, but it wasn't this intense either. Com'on guys, forget the light switch and flip the switch for some fun. The switchplate is an ideal installation for The Sewer Den, but doesn't properly fit my switches. It has sadly stayed in its packaging for years now. A cowabunga crime. The back of the packaging features other switchplates that were once available. The designs are better than the one I have, featuring entertaining, ninja-fueled scenes. It's an action-packed adventure every time you turn on the light! At some point during the 2K3 series, TMNT Monster Trucks became popular. This unlikely combo produced a slew of strange merchandise, like this pennant. I first saw one of these years ago in Portland, Oregon and for some idiotic reason, didn't buy it. The missed opportunity haunted my collecting conscience. After endless searching and digging deep into the internet, I finally found another one. Rejoice! 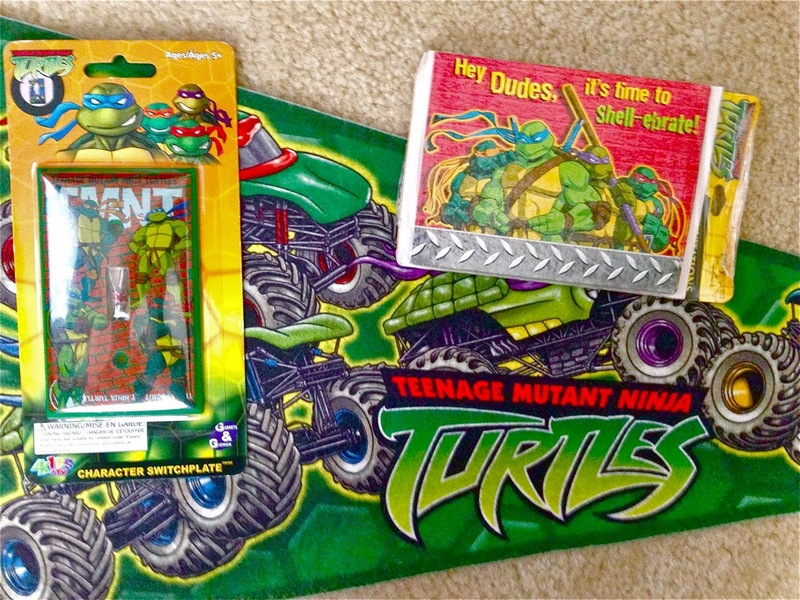 The pennant embraces everything I love about silly TMNT merchandise. It's a throwback to the absurd goodies released in the late 80s & early 90s. Nothing about it makes sense - it's just a mutated mashup of pop culture. Crafted from what seems to be an indestructible material, the pennant can be folded, bent, and rolled into any shape without causing damage. I stored it with multiple folds and the durable design didn't even crease. It's the Super Shredder of pennants. The 2K3 series sure kept us on our toes with its random merchandise. Celebrations, switchpates, and Monster Truck pennants! Who knew?